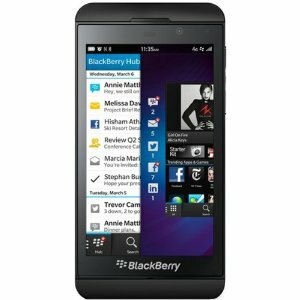 The Z10 from Blackberry is a great smartphone that suits both work and personal use. The Blackberry 10 operating system and a dual-core processor are featured and the Z10 is ready for 4G on networks supporting this. The camera is simply superb with its 8-megapixel resolution and enhancing features that include image & video stabilisation, autofocus, 5x digital zoom and 1080p HD video recording. All connectivity options are ready for use including Wi-Fi, Bluetooth, GPS and NFC. The preloaded apps are just the beginning of this phone's highlights and these include Blackberry Calendar, Docs to Go, Facebook, Twitter, Blackberry Hub, Foursquare, Maps, YouTube, Adobe Reader and Camera Time Shift.